The Jayrow and Flyon Pty Ltd partnering agreement commenced operations from Mackay Airport in December 2016 following the award of a marine pilot transfer contract by Torres Pilots Pty Ltd. In reviewing their requirements, Torres Pilots sought to engage with an aviation provider that could provide reliable and secure services for their marine pilotage operations 24/7. Hydrographers Passage, a deep channel passage with its Pilot Boarding Ground lying 110 nautical miles offshore from the coal export terminals of Dalrymple Bay and Hay Point is the longest Helicopter Marine Pilot Transfer in the world. All marine pilot transfers (MPTs) are conducted via land-on helicopter at Blossom Bank pilot boarding ground. 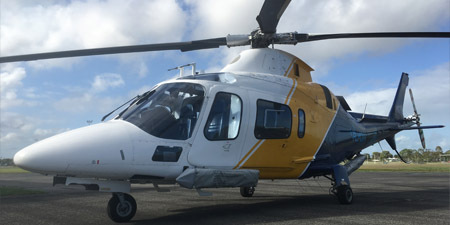 The Mackay base operates three Augusta Westland AW109E twin helicopters capable of 24/7 IFR operations. All of the Mackay pilots are rated for multi engine command and are highly experienced in IFR (Instrument Flight Rules) operations. 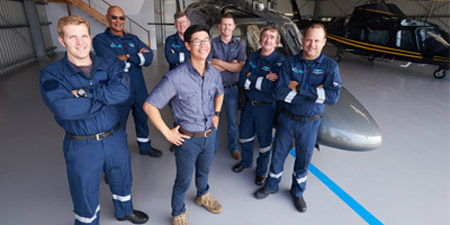 The pilots group has over 52,000 hours total time in helicopters and over 22,000 ship landings in offshore operations. All pilots operate under a CASA approved FRMS (Fatigue Risk Management System). All of the IFR Captains have attended type rating courses and simulation for the AW109. The engineering team consists of two factory trained full time engineers and an engineering apprentice, including a fully qualified avionics engineer. Other services offered from the Mackay base include Maritime Support, Corporate Charter, Mine Charter and Premium Tourist Charter.